Do you want to cry when a liberal criticizes Donald Trump? For any reason? Do you feel like throwing a temper tantrum when a liberal says Obama was a better president than the current man-child-in chief? Do you tear up when a liberal says Hilary Clinton would be more presidential? Were you offended when liberals accused Trump of being xenophobic for his Muslim ban? Do you get misty eyed when a liberal accuses Trump of bigotry for banning transgenders from the military? Did you accuse liberals of playing the race card when they criticized Trump for questioning Barack Obama’s birth certificate? Did you also accuse liberals of playing the race card when they called Tomi Lharen a racist for saying Black Lives Matter was just like the KKK? Did you tear up along with Tomi Lahren and Donald Trump when watching news footage of ‘our beautiful’ confederate statues being toppled? But for you , there is no cure. 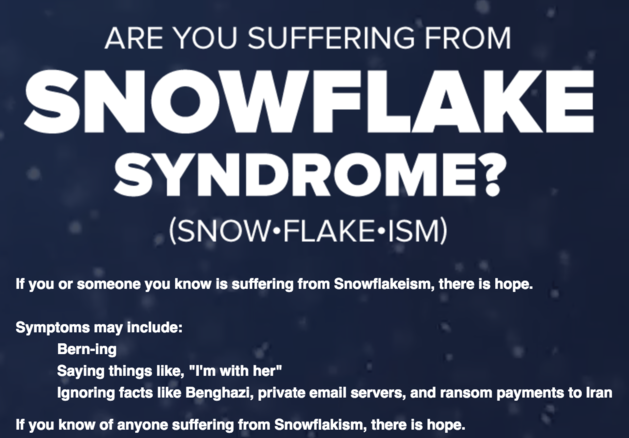 As long as you are a Trump supporter , and believe alternate facts like the ones above , are real facts , you will always be a snowflake.